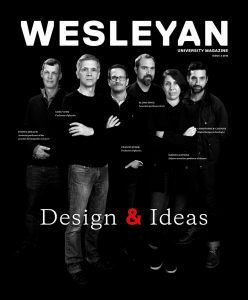 Research by Associate Professor of Government Erika Franklin Fowler and the Wesleyan Media Project (WMP) on campaign advertising, health care policy, and political communication is resonating far beyond Wesleyan’s campus, informing work in government, nonprofits, and the private sector. Meanwhile this spring, WMP has begun issuing regular analyses of political advertising in the lead-up to the 2018 elections, including a report on the increasing prevalence of gun reference in ads. In January, the Bipartisan Policy Center released a major report, The State of Campaign Finance in the U.S., which relied heavily on data and research from WMP. The task force that developed the report, led by a Stanford law professor and top lawyers from both parties, intended for it to “lay the groundwork for a common, bipartisan understanding of how Citizens United shaped the campaign finance landscape with an eye toward any possible future reforms,” said Fowler. It is likely to be used by policy makers and legislators. A WMP report, coauthored with the Center for Responsive Politics, is also available on the Bipartisan Policy Center website. Additionally, in September 2017, WMP’s health media research was cited in a letter from Democratic members of the House Committee on Energy and Commerce to Health and Human Services Secretary Tom Price and Seema Verma, administrator of the Center for Medicare & Medicaid Services. This research found a strong relationship between the volume of TV advertising on health insurance and reductions in the uninsured rate under the Affordable Care Act. WMP’s health media research is also being used by staff at the Congressional Budget Office. “After reading our research, they were convinced to include advertising as a control variable in their own research,” said Fowler. Finally, Facebook has sought help from the WMP in leading conference calls soliciting wide-ranging journalist and academic feedback on the digital ad archive they are building.